The subfield of physics that explains the interaction of charged particles and light is called quantum electrodynamics. Quantum electrodynamics (QED) extends quantum theory to fields of force, starting with electromagnetic fields. Under QED, charged particles interact by the exchange of virtual photons, photons that do not exist outside of the interaction and only serve as carriers of momentum/force. Notice the elimination of action at a distance, the interaction is due to direct contact of the photons. In the 1960's, a formulation of QED led to the unification of the theories of weak and electromagnetic interactions. This new force, called electroweak, occurs at extremely high temperatures such as those found in the early Universe and reproduced in particle accelerators. Unification means that the weak and electromagnetic forces become symmetric at this point, they behave as if they were one force. Electroweak unification gave rise to the belief that the weak, electromagnetic and strong forces can be unified into what is called the Standard Model of matter. Quantum chromodynamics is the subfield of physics that describes the strong or ``color'' force that binds quarks together to form baryons and mesons, and results in the complicated the force that binds atomic nuclei together. The strong force overcomes the electromagnetic or gravitational forces only on very short range. Outside the nucleus the effect of the strong force is non-existent. Newtonian physics assumes a direct connection between cause and effect. Electric and magnetic forces pose a dilemma for this interpretation since there is no direct contact between the two charges, rather there is an action at a distance. To resolve this dilemma it was postulated that there is an exchange of force carriers between charged particles. These force carriers were later identified with particles of light (photons). These particles served to transfer momentum by contact between charged particles, much like colliding cars and trucks. However, this attempt to resolve the action at a distance paradox uses a particle nature to light, when observation of interference patterns clearly shows that light has a wave-like nature. It was this dual nature to light, of both particle and wave (see wave/particle duality), that led to the revolution known as quantum physics. Is that it? 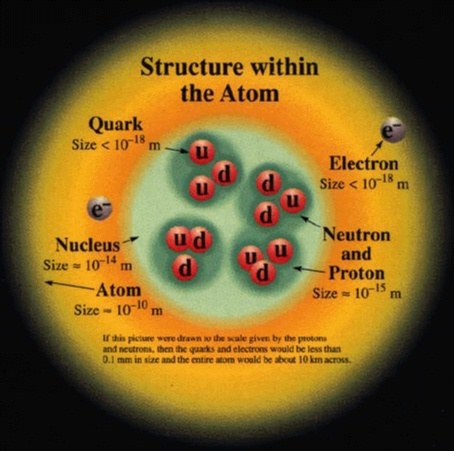 Are quarks and leptons the fundamental building blocks? Answer = maybe. We are still looking to fill some holes in what is know as the Standard Model. The Standard Model is a way of making sense of the multiplicity of elementary particles and forces within a single scheme. The Standard Model is the combination of two schemes; the electroweak force (unification of electromagnetism and weak force) plus quantum chromodynamics. Although the Standard Model has brought a considerable amount of order to elementary particles and has led to important predictions, the model is not without some serious difficulties. For example, the Standard Model contains a large number of arbitrary constants. Good choice of the constants leads to exact matches with experimental results. However, a good fundamental theory should be one where the constants are self-evident. The Standard Model does not include the unification of all forces and, therefore, is incomplete. There is a strong expectation that there exists a Grand Unified Field Theory (GUTS) that will provide a deeper meaning to the Standard Model and explain the missing elements. Even a GUTS is incomplete because it would not include spacetime and therefore gravity. It is hypothesized that a ``Theory of Everything'' (TOE) will bring together all the fundamental forces, matter and curved spacetime under one unifying picture. For cosmology, this will be the single force that controlled the Universe at the time of formation. The current approach to the search for a TOE is to attempt to uncover some fundamental symmetry, perhaps a symmetry of symmetries. There should be predictions from a TOE, such as the existence of the Higgs particle, the origin of mass in the Universe. One example of a attempt to formula a TOE is supergravity, a quantum theory that unities particle types through the use of ten dimensional spacetime (see diagram below). Spacetime (4D construct) was successful at explaining gravity. What if the subatomic world is also a geometric phenomenon. Many more dimensions of time and space could lie buried at the quantum level, outside our normal experience, only having an impact on the microscopic world of elementary particles. It is entirely possible that beneath the quantum domain is a world of pure chaos, without any fixed laws or symmetries. One thing is obvious, that the more our efforts reach into the realm of fundamental laws, the more removed from experience are the results. Another recent attempt to form a TOE is through M (for membrane) or string theory. String theory is actually a high order theory where other models, such as supergravity and quantum gravity, appear as approximations. The basic premise to string theory is that subatomic entities, such as quarks and forces, are actually tiny loops, strings and membranes that behave as particles at high energies. One of the problems in particle physics is the bewildering number of elementary particles (muons and pions and mesons etc). String theory answers this problem by proposing that small loops, about 100 billion billion times smaller than the proton, are vibrating below the subatomic level and each mode of vibration represents a distinct resonance which corresponds to a particular particle. Thus, if we could magnify a quantum particle we would see a tiny vibrating string or loop. The fantastic aspect to string theory, that makes it such an attractive candidate for a TOE, is that it not only explains the nature of quantum particles but it also explains spacetime as well. Strings can break into smaller strings or combine to form larger strings. This complicated set of motions must obey self-consistent rules and the the constraint caused by these rules results in the same relations described by relativity theory. Another aspect of string theory that differs from other TOE candidates is its high aesthetic beauty. For string theory is a geometric theory, one that, like general relativity, describes objects and interactions through the use of geometry and does not suffer from infinities or what is called normalization problems such as quantum mechanics. It may be impossible to test the predictions of string theory since it would require temperature and energies similar to those at the beginning of the Universe. Thus, we resort to judging the merit of this theory on its elegance and internal consistence rather than experiment data.